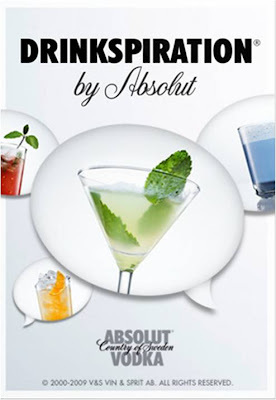 Absolut Drinkspiration is a new, free iPhone App from Absolut Vodka. The Drinkspiration application is effectively a virtual drink selector that contains over 400 drinks including drinks based on Vodka, Gin, Rum, Brandy, Whisky and Tequila. The Absolut Drinkspiration App allows you to select drinks using various criteria - where you are, what's popular, Taste, Colour, Music volume, time of day and many others. "This sophisticated and interactive mobile drinks app combines the 3G iPhone technology with GPS, Twitter and Facebook, guiding you to a personalised drink recommendation based on real-time trends and data." The Drinkspiration App also lets you keep a personal order history (could be useful!) and allows you tell friends where you are and what you are drinking via the Twitter and Facebook integrative capabilities. 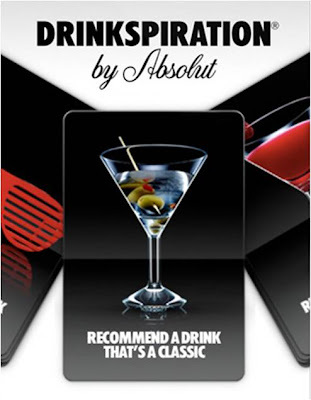 The Absolut Vodka Drinkspiration App is a nice way of taking the Absolut brand onto the iPhone, making use of the full array of functionality that the iPhone offers. Another example of how smart phones are now allowing advertisers to create effective brand experiences on mobile. Note from the App store - "due to its references to alcoholic content, Apple classify the Drinkspiration app as 17+. However, since the application is sponsored by ABSOLUT VODKA, by downloading it you state you are over the age of 21."